Many times we come across projects and presentations where the best way to explain a dataflow concept or the user to server interaction can be best explained with a diagram like DFD or UML etc. Here is an online tool that might come in handy. Diagram.ly is an online diagram drawing application which let you create professional looking for workflow, BPM, org charts, UML, ER, network diagrams. Its completely free and requires no login or registration and the let you to save the diagrams locally. 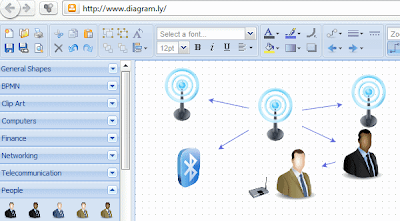 The site has a collection of vast array of stencils, clip arts, graphics which you can drag and drop into your diagram to add them and supports Visio import and real time diagram sharing. You can drag objects into the drawing area just by dragging across the interface from the collection of onscreen palettes, and you can choose from available flowchart shapes as well as various clipart graphics to help explain your ideas visually. It supports connecting lines with different types arrows and flow lines so that you can show connections and process, data flow. 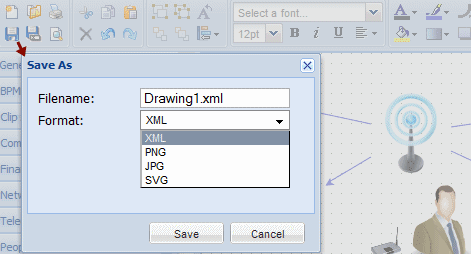 Once you’re finished with the diagram, you can save your work in its native XML format, as well as PNG, JPG, or SVG images. And in case you need to make changes, just re-import your saved XML and you’re ready to go to re-draw from where you left. You can also check out Simple Diagrams which is a simple desktop application that helps you express your ideas diagrammatically, it keeps the visual expression clear through the simple design with its cool library of stencils, pencil drawn like items and backgrounds. If you are specifically looking to create UML and DFD diagrams the try Diagram Designer. It helps users to quickly design simple data flow charts, UML, DFD etc which should appeal to software designers and application programmers.